Many people buy antique and vintage chairs for their dining rooms, but a single vintage chair is a wonderful addition to a home office too. An antique or vintage chair looks superb in your office, study, writing studio or other work space, whether you have a traditional office decor or a more eclectic look in your study. Our customer William in Knoxville, TN, proves the point. William bought this lovely French vintage dining chair or accent chair from us to team with an antique desk he already owned. The vintage chair from France is designed in the Renaissance Henry II style and it dates to 1930. The chair still boasts its original brown leather upholstery on the back of the chair, embossed with a flourishing floral design. The bottom seat cushion had already been reupholstered. 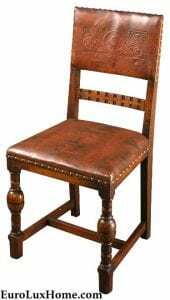 This nicely carved chair has attractive detailing on the legs and nail head trim on the brown leather upholstery. It looks very regal and the traditional style is great for William’s home. Here is the chair paired with William’s very handsome French Renaissance antique desk. The combination of aged wood and leather really creates a lovely luxurious and traditional atmosphere in a room. You will notice that the embossed leather on the vintage chair at the desk ties in with the leather arm chair and the two leather sofas. I love the color of those blue leather sofas! The wood-framed fireplace also looks wonderful and William’s statues and figurines adorning the space create elegant decorative accents. William’s study looks like a very welcoming place to write letter or curl up and read books on a rainy day! Often we have antique and vintage chairs available in singles as well as sets, and the single chairs are well-priced. We also have pairs of chairs available, so you can buy one for your own desk chair and another for your clients or visitors. It looks very cool and unusual to have a genuine antique or vintage chair from France in your work space and it’s a great conversation starter! This entry was posted in Client Spotlight and tagged 1930s vintage, antique desk, French Renaissance Chairs, French Vintage Dining Chairs, French Vintage Furniture, living with antiques, office, office furniture on September 4, 2018 by admin. Our Georgian-style desk looked perfectly at home in our customer’s historic Charleston house. I hope you enjoy these photos as much as I enjoyed the trip! Every once in a while, Greg and I love to skip out of town and head for Charleston as it is only a two-hour drive. I greatly enjoy taking a stroll around the Battery, smelling the salt air and admiring the gorgeous historic homes. So when Susan purchased a handsome antique-inspired desk from us on Houzz, we knew we’d make this delivery! 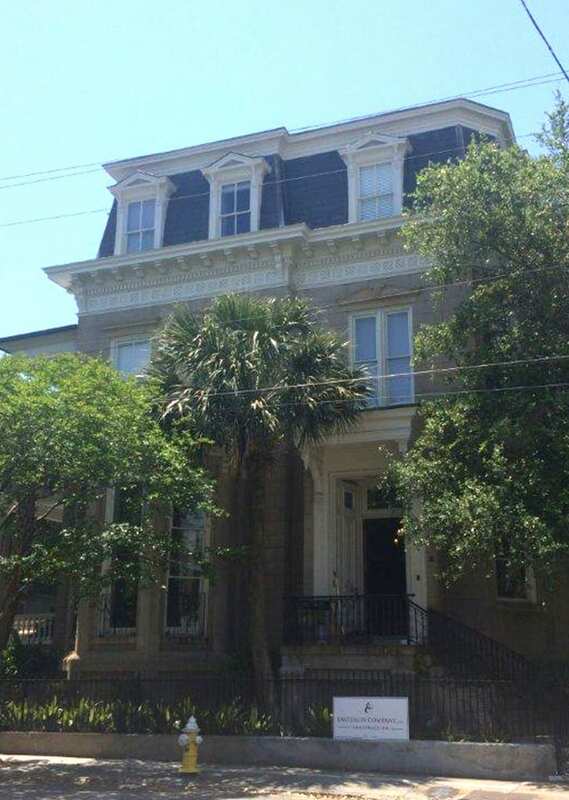 Susan and her family moved to Charleston several years ago, but just purchased this fantastic home in the Downtown historic district a few months ago. This is the very grand new oval partners desk that Susan ordered from us from our selection of new and antique desks. The antique-inspired Georgian-style desk is six feet long and what an impressive six feet it is! 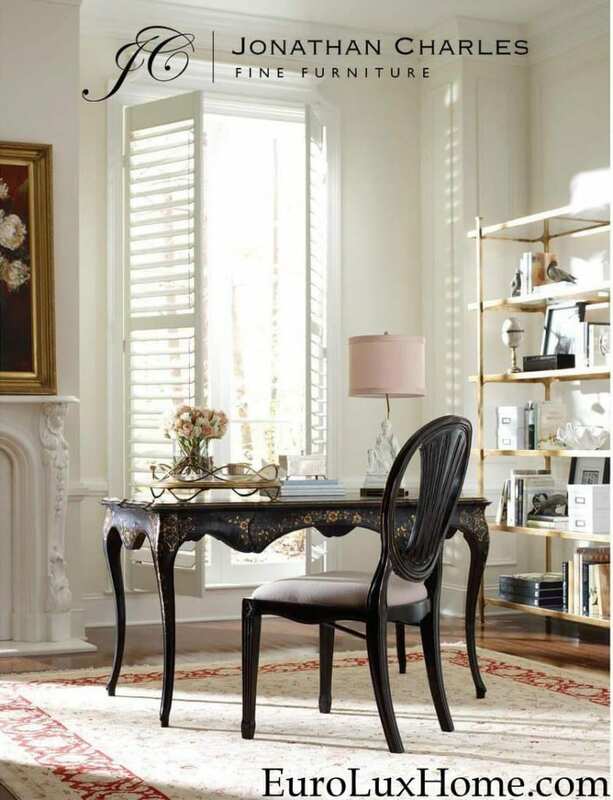 The oval desk is crafted in rich flame mahogany with banded inlay for extra decorative effect. Three hand-tooled leather panels on the oval top, fluted detail on the pillars and classic old-fashioned handles give this elegant desk tons of traditional appeal. If we have to be practical 🙂 there’s lots of drawer space too! Susan’s home dates to 1852 but the prior owners had already done most of the renovations. The hardwood floors were still being finished in the front entry hall as we came in, but when we set the Georgian-style oval partner’s desk (Item BG-230) in place in her husband’s office, that room was finally complete! I just loved seeing how the whole room tied together – from the original molding around the doors and the incredible 10 foot tall pocket door, to the classic brass chandelier light fixture and patterned Oriental rug. 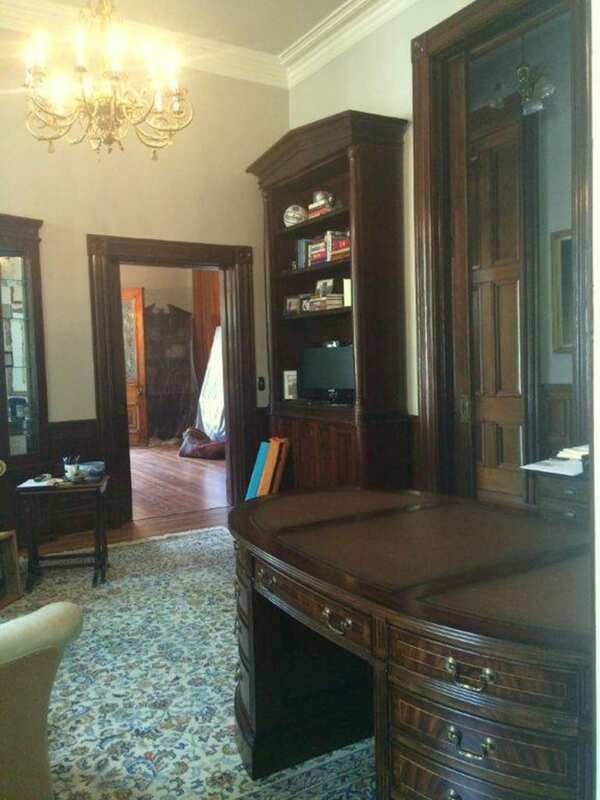 The leather-topped desk with flame-mahogany veneer looked quite at home in this stately Charlestonian mansion. If only the walls could tell stories! We headed back to Newberry after a delicious lunch of shrimp and grits, a Charlestonian specialty! 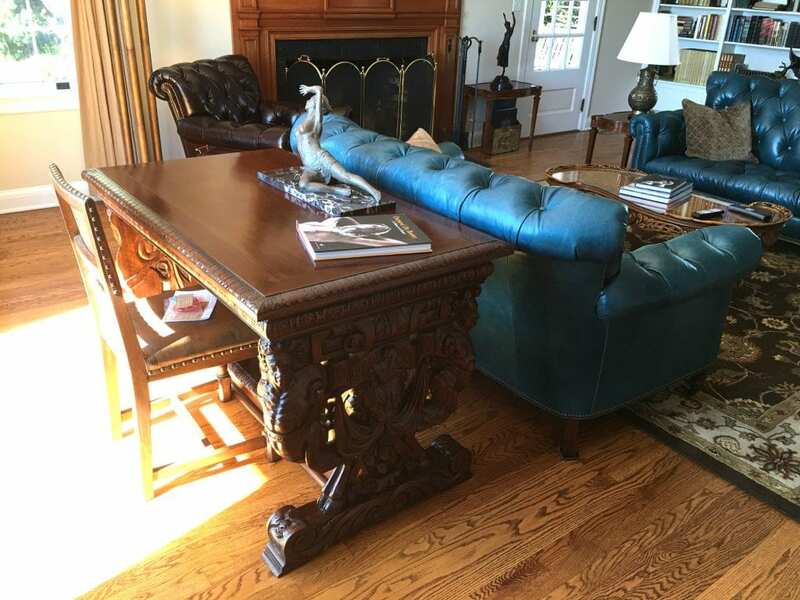 This entry was posted in Client Spotlight and tagged antique inspired furniture, charleston, Georgian Style, high quality reproduction furniture, Historic House, office, office furniture, Partners Desk, South Carolina on May 17, 2016 by admin. My last blog post was about Creating a Beautiful Home Office and today I’ll zone in on picking the perfect desk, whether you have a home office or not! A desk needs to combine function with good looks. There’s no point have a desk that looks amazing if it doesn’t provide the storage and work space you need. It’s also miserable having a desk that is adequately functional if you don’t take pleasure every single time you sit down to use it. Life is too short! The Unique Antique Desk. If you love antiques and want a true original in your home office, then an antique desk is a joy to use as it carries so much history. This one is an antique French Gothic desk that we currently have in stock, dating to 1850 and heavily carved in solid oak. 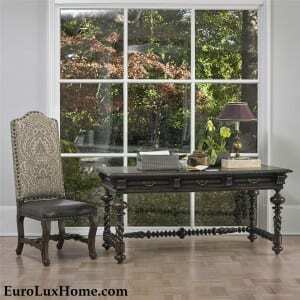 It hides a little surprise as the antique Gothic desk has been gently modernized for the 21st century. Someone added a slide-out wooden keyboard tray that blends so well, you’d think it was original! The Vintage French Desk. If you love French Country style and prefer a lighter wood desk, this gorgeous 1950 vintage French Country secretary desk is a great choice. 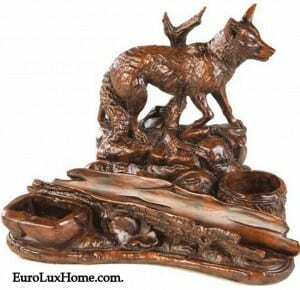 The golden oak is very nicely carved and it’s well-sized for today’s interiors at just under 3 feet wide. If you want a French Country desk, then features to look for include sweet little cabriole legs, and elegant but simple carvings like the heart-shaped swag on this pull-down desk front. The Partners Desk. Sometimes only a very substantial partners desk will do! 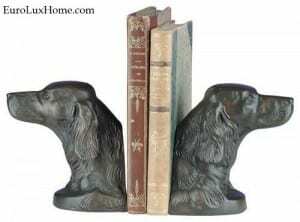 We now carry antique-inspired furniture by Scarborough House. Their high-quality, hand-crafted pieces include a wide choice of desks like this oval Scarborough House partners desk. The handsome brass handles, crotch mahogany and a leather surface make it an impressive addition to your study, home office or professional office. If you buy a partners desk, always pick the handsomest and highest quality desk that you can as it will pay you back over the years. A good desk endorses your professional image to clients and business colleagues. The Versatile Desk. If you don’t have a home office as such, then you might want a desk that blends in with your living space. 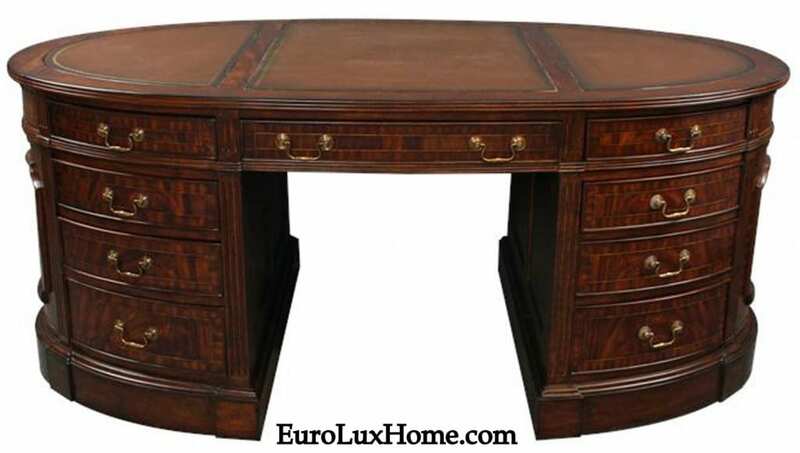 This Ambella Home Modesto desk is a good example. 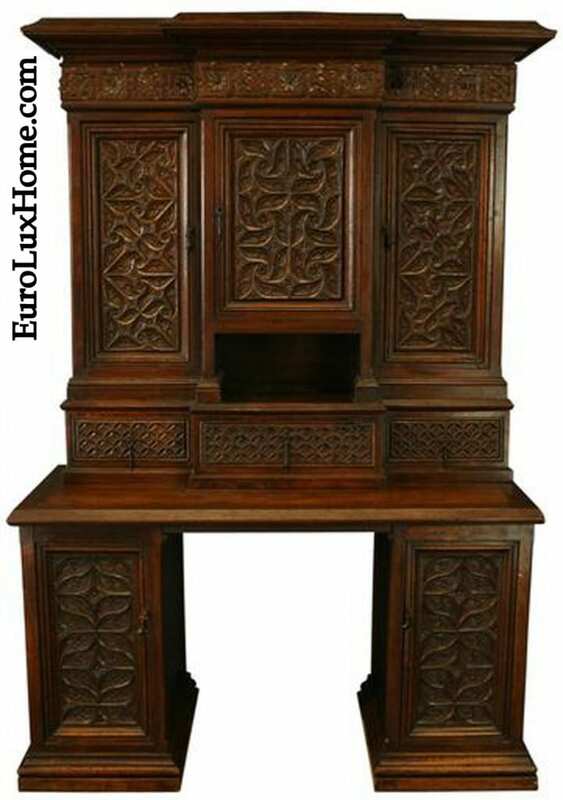 The antique-inspired desk features lots of ornate carving detail, a generous desk surface and drawer storage space to keep the room free from clutter. 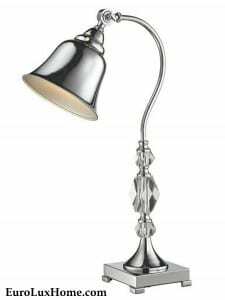 But when you aren’t writing at your desk it just looks like a lovely decorative piece of furniture. Pop a bowl of flowers on top to add to the accent table effect! The Lots of Nooks and Crannies Desk. Sometimes you don’t need tons of storage space but you do want lots of separate compartments to keep everything well organized! 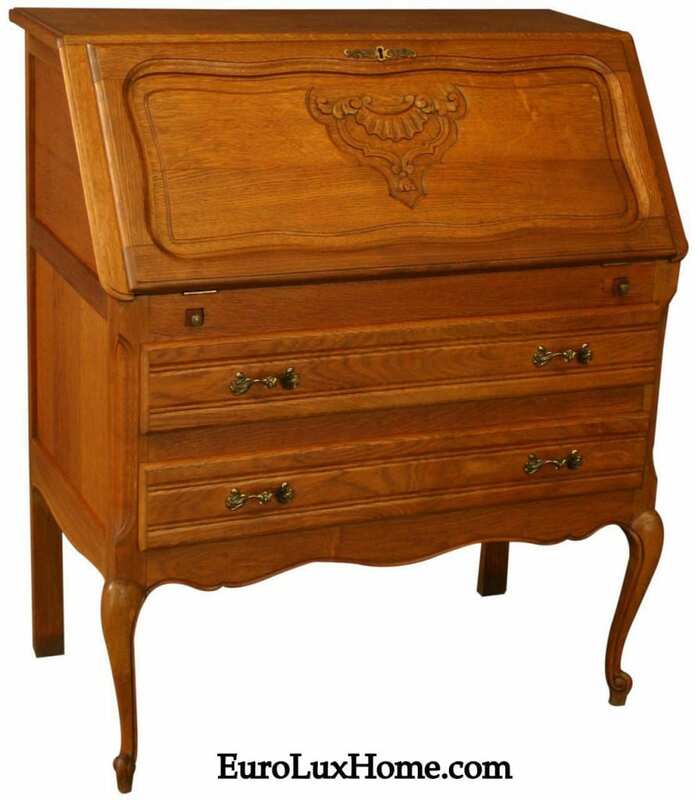 This Scarborough House Sheraton Writing Desk is a charming example. Aside from all the drawers and cubbies, the exquisitely crafted crotch mahogany desk looks amazing. The brass handles and leather writing surface make it seem so authentic. I think that Jane Austen would have been at home writing Pride and Prejudice at this desk! The Artist’s Desk. 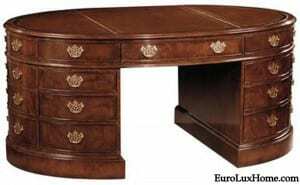 If beauty triumphs over all in your home office, then you are probably looking for a highly decorative desk that makes you smile at its craftsmanship. (You’ll be happy to keep your documents tucked out of sight in a filing cabinet as long as the desk looks fantastic!) 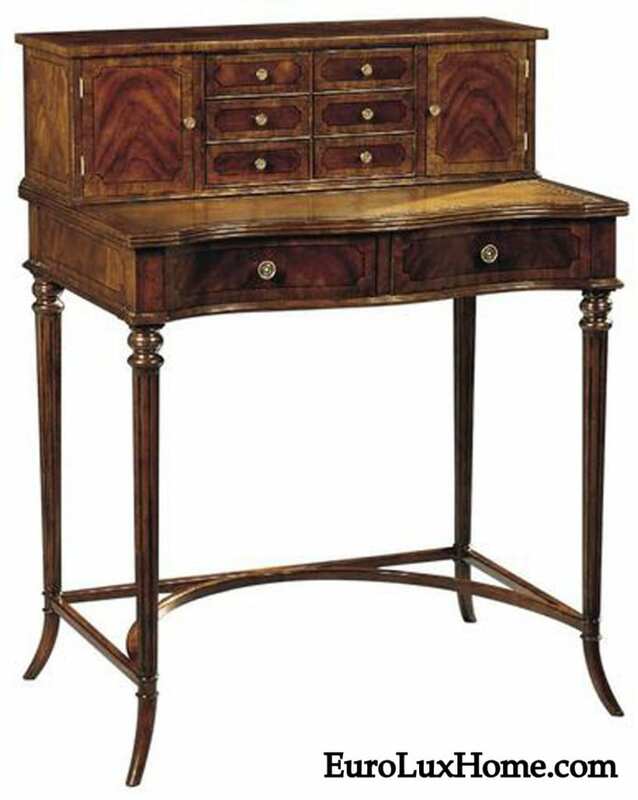 In that case, you have to admire this superb Jonathan Charles desk from the Kensington collection. The French style desk is hand-painted by Jonathan Charles artisans with gold floral detail across the pretty curved apron and legs. A dark leather inlaid writing surface tempts you to stay all day. There is one drawer to keep your favorite pens and essential notes, but this gilded desk is more like a French Haute Couture dress. You buy it for the sheer wicked pleasure of it and because it makes you look so good! Boy, now I am feeling very bored with my own desk that I’m writing this at! I hope you enjoy picking your perfect desk whatever style you like. Please leave a note in the comment box to tell me YOUR idea of a perfect desk! 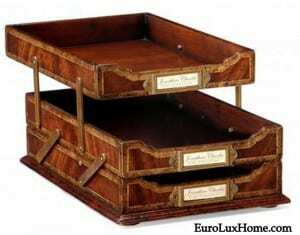 This entry was posted in Antique Furniture, Home Design Ideas and tagged Ambella Home, antique desk, antique inspired furniture, creative home decorating, design inspiration, home organization, Jonathan Charles, office, office furniture, Scarborough House on March 31, 2016 by admin. Spring is the time of year when everyone organizes their home office, tidying up files and throwing out clutter! But the best home offices are as beautiful as they are functional. Your office should be a place where you can express your personality as well as work, manage paperwork and finances, and receive clients! This stunning home office featuring antique-inspired furniture by Jonathan Charles is packed with personality! 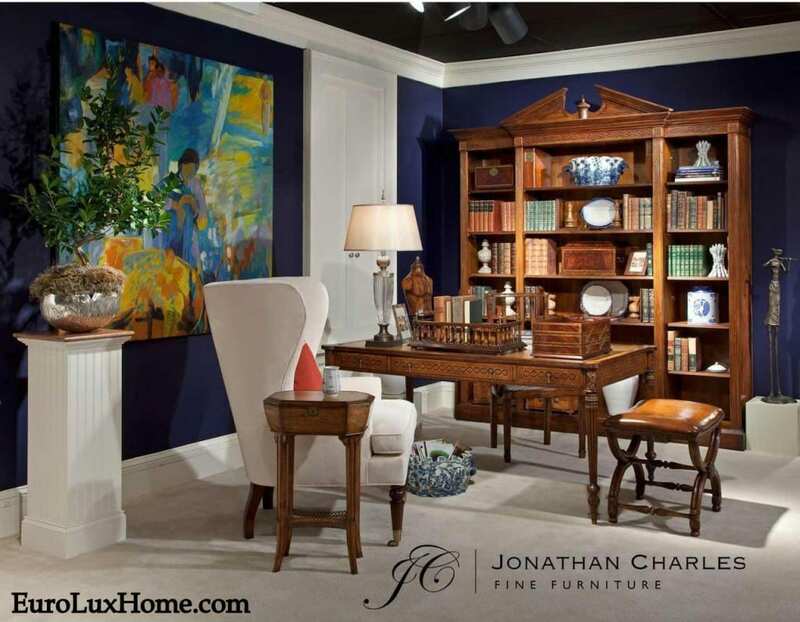 We love the Jonathan Charles furniture and home accents we carry because each piece is crafted to look authentic and last a lifetime, often using the same techniques that furniture makers used hundreds of years ago. The deep blue walls and colorful artwork in this office create an eclectic effect paired with the traditional office furniture. The white upholstery and carpet are a little unexpected, adding another bright and sophisticated touch. Marie Kondo’s best-selling book: The Life-Changing Magic of Tidying Up!) The modern and airy look of the room is grounded by the substantial wood furniture and bold metal hardware. It shows how traditional furniture can be given a completely unique spin by a homeowner who is willing to mix up their styles a bit and combine pieces they love. A large plant in the corner also makes an office so much more welcoming and we love the faux zebra rug for a dash of exotic character! 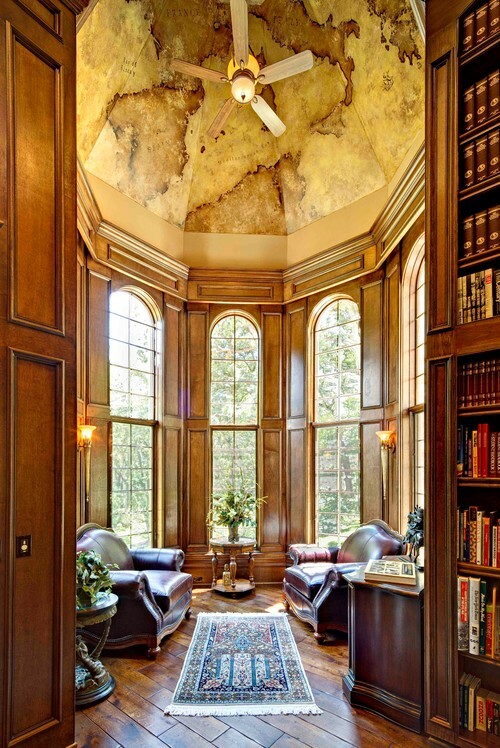 If you want to get truly arty, then how about this amazing traditional home office in Chicago? The domed ceiling boasts a custom-painted mural of the Mediterranean – once you spot Italy on the right of the ceiling fan you can figure out how the map falls into place. This is a splendidly designed room with wood paneling, wood plank floor, and huge windows too, but even if you don’t have such a fabulous space to work in, you can take a few tips. Choose a couple of comfortable and very handsome leather sofas for relaxed business conversations, Add a colorful tapestry or rug and plenty of book on the shelves and you’re set! Traditional Home Office by Bethesda General Contractors Meridian Homes Inc. This traditional home office in Washington D.C. is actually quite streamlined and simple when you look closely, but it creates a strong impression because of the club style leather chairs and the impressive antique-inspired desk. The high vaulted ceiling helps to add architectural interest, but the main thing that creates decorative appeal at ceiling level is the large chandelier lighting. A chandelier always makes a statement and sets the tone for a room. I hope that these beautiful home offices have given you some ideas on how to jazz up your own office this spring! In my next post, I’ll share some of my favorite antique and antique-inspired desks and other home office furniture and decor accents to make your office beautiful and beautifully organized too! 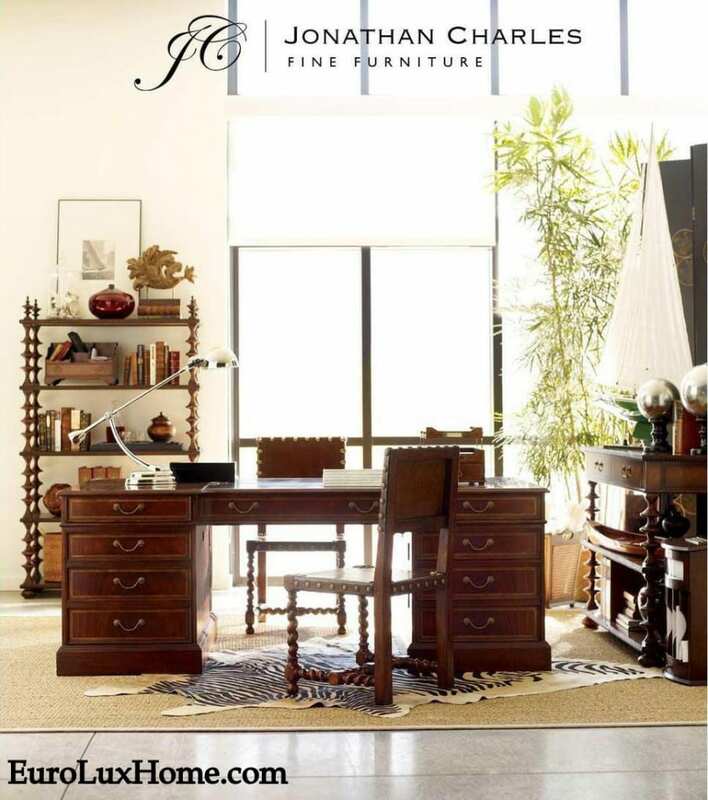 This entry was posted in Antique Furniture, Home Design Ideas and tagged antique desk, antique inspired furniture, bold colors, creative home decorating, design inspiration, Eclectic, home organization, Jonathan Charles, Leather furniture, mural, office, office furniture on March 29, 2016 by admin.